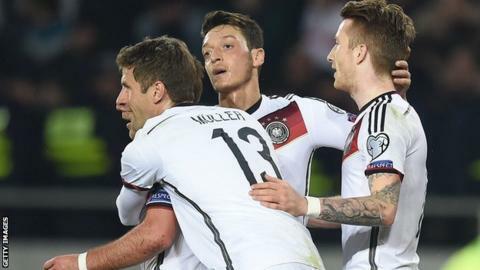 World champions Germany booked their place at Euro 2016 with an unconvincing win over Georgia. Joachim Low's side struggled before they were awarded a second-half penalty, which Thomas Muller converted. Georgia captain Jaba Kankava levelled with a superb left-foot volley from outside the box. Substitute Max Kruse had the final word, getting on the end of Mesut Ozil's precise through ball to coolly slot home the winner. Germany also had goalkeeper Manuel Neuer to thank after he made a superb save to tip over a Tornike Okriashvili effort at 1-1. A point was all the world champions needed to qualify for the European Championship in France next summer, and they topped Group D ahead of Poland, who beat the Republic of Ireland to take the second automatic qualification spot. Germany manager Low said: "We know that is not what we demand from ourselves. Not the way we are currently operating in front of goal. We made our own life difficult. "We are satisfied with the qualification but not satisfied with our last two games [they lost 1-0 to the Republic of Ireland on Thursday]. That is not our standard. We have work ahead of us." Match ends, Germany 2, Georgia 1. Second Half ends, Germany 2, Georgia 1. Mats Hummels (Germany) is shown the yellow card for a bad foul. Foul by Mats Hummels (Germany). Tornike Okriashvili (Georgia) wins a free kick in the attacking half. Attempt missed. Max Kruse (Germany) left footed shot from the centre of the box is too high. Assisted by Mesut Özil following a corner. Corner, Germany. Conceded by Nukri Revishvili. Attempt missed. Toni Kroos (Germany) right footed shot from outside the box is close, but misses to the left. Assisted by Max Kruse. Substitution, Germany. Karim Bellarabi replaces Marco Reus. Substitution, Georgia. Aleksandr Kobakhidze replaces Valeri Qazaishvili. Corner, Germany. Conceded by Ucha Lobzhanidze. Attempt saved. Jonas Hector (Germany) left footed shot from the left side of the box is saved in the bottom left corner. Assisted by Ilkay Gündogan. Attempt missed. Mate Vatsadze (Georgia) right footed shot from outside the box misses to the left. Foul by Jerome Boateng (Germany). Tornike Okriashvili (Georgia) wins a free kick in the defensive half. Goal! Germany 2, Georgia 1. Max Kruse (Germany) left footed shot from the centre of the box to the bottom left corner. Assisted by Mesut Özil. Substitution, Georgia. Zurab Khizanishvili replaces Nika Kvekveskiri. Attempt missed. Toni Kroos (Germany) right footed shot from outside the box is high and wide to the left. Assisted by Ilkay Gündogan. Substitution, Germany. Max Kruse replaces André Schürrle. Foul by Toni Kroos (Germany). Tornike Okriashvili (Georgia) wins a free kick on the right wing. Attempt blocked. Ilkay Gündogan (Germany) right footed shot from outside the box is blocked. Assisted by Mesut Özil. Tornike Okriashvili (Georgia) is shown the yellow card for a bad foul. Delay in match Ilkay Gündogan (Germany) because of an injury. Ilkay Gündogan (Germany) wins a free kick on the right wing. Foul by Tornike Okriashvili (Georgia). Attempt saved. Marco Reus (Germany) right footed shot from outside the box is saved in the bottom right corner. Assisted by Mats Hummels. Attempt saved. André Schürrle (Germany) right footed shot from the centre of the box is saved in the centre of the goal. Assisted by Mesut Özil. Attempt saved. Mate Vatsadze (Georgia) left footed shot from outside the box is saved in the centre of the goal. Assisted by Ucha Lobzhanidze. Offside, Georgia. Nukri Revishvili tries a through ball, but Mate Vatsadze is caught offside. Offside, Germany. Toni Kroos tries a through ball, but Marco Reus is caught offside. Attempt blocked. Mesut Özil (Germany) left footed shot from the centre of the box is blocked. Attempt blocked. André Schürrle (Germany) right footed shot from the right side of the box is blocked. Assisted by Mesut Özil. Corner, Georgia. Conceded by Manuel Neuer. Attempt saved. Tornike Okriashvili (Georgia) right footed shot from the centre of the box is saved in the top centre of the goal. Attempt missed. Valeri Qazaishvili (Georgia) right footed shot from the centre of the box is too high. Assisted by Tornike Okriashvili. Toni Kroos (Germany) wins a free kick on the left wing.